Z.E. Frey has authored I Won’t Apologize for Being a Woman, Conquering Haters Dealing with Negative People, Sticks & Stones Conquering Haters with Poetry, and Open, Candid Haikus about Everyday Life. Z.E. Frey is also the contributing author and copyeditor of the wellness book, Prevention Benefits, Healthy Employees Cost Less and published IUSB’s Women’s Studies’ book Michiana Monologues, A World of Difference. Z.E. Frey's "Open: Candid Haikus about Everyday Life" is an interesting take on the standard haiku format. The book is divided into seven sections, each devoted to a different theme, including sections on love, work, faith, racism and friendship. Don't expect the old conventions -- there is no reference to seasons and the focus is not on physical images. These haiku are snapshots of emotion, and the effect of stringing them together, six to a page, is that they create a kind of poetic essay, with each haiku offering a single stone in the kaleidoscope pattern of the overall thought. Because of the relatedness of the individual poems, I think the book is most effectively read a section at a time. That doesn't mean there aren't individual gems. There were "aha!" moments (It looks nice from here/ But I’m seeing piles of bills./Envy fades away.) and moments of recognition (In order to grow, /I must learn how to forgive./Damn. That’s a challenge.). Some of the haiku just beg to be copied on a post-it and stuck to my mirror (Eyes are like fire/When you speak arrows of truth./Killing the slander.). For those to whom it matters, Frey uses profanity, but it is artistically true to her voice, not thrown in for shock. Frey's authentic voice is perhaps the best part. She shows so many individual facets of her mind and heart that she creates a wonderful mosaic of herself. 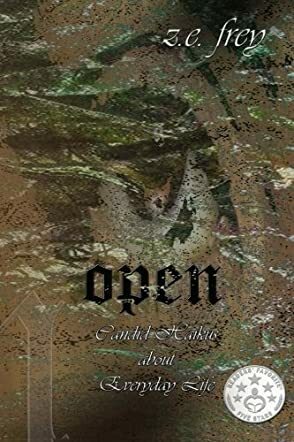 "Open" is definitely worth the time to read. I suspect I will reread it.